What a joy it is to have picked up this book. It is pretty, elegant and even classy. The book is well organized into various sections for ease of use. Alicia’s pictures of life at home and of various gourmet dishes are delectable. Her writing is thoughtful and witty. She doesn’t preach, she encourages and is the first, to my knowledge, to point out that our bodies are designed for a plant based diet and not an animal based one! Finally! I am sure she is not the only one but she explains it in a short but to the point paragraph and, once again, without preaching. 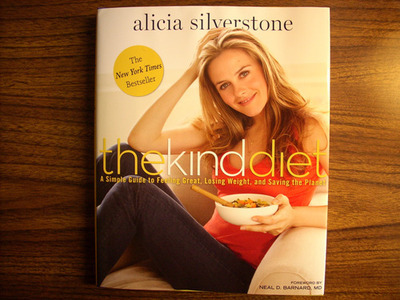 Alicia Silverstone’s recipes look so yummy, i want to eat them all. She organized them in three sections: Flirting, Vegan and Superhero (I love the choice of words!). And reading this sections made me realize that i was still flirting as in still replacing former meat centered dishes with vegan versions instead of the revamp that she talks about in the « vegan » section. The « superhero » section is for the die hard committed vegans wanting to get into macrobiotic as well. Strangely enough, it seems easier to me than the « vegan » section but more demanding than the « flirting » section. © Copyright July 2010 – All Rights Reserved. Printing by permission only.